Coffee and Tea. 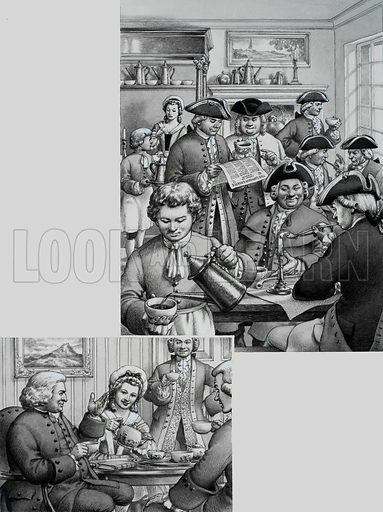 The top picture shows a typical London coffee house in the 18th century; the picture on the left shows Dr Johnson taking tea, being entertained by Mr and Mrs Thrale. Notice that the tea cups have handles, unlike the ones in the picture above. Original artwork for illustration on p33 of Look and Learn issue no 710 (23 August 1975). Available worldwide for immediate download up to 3,459 x 4,626 pixels.